Hawaiian Airlines passengers made it safely to Maui from Seattle yesterday after their original plane was forced to turn around Friday when a piece of the wing came loose. Hawaiian Flight 29 took off from the Seattle-Tacoma International Airport at 10:34 a.m. Friday morning. Shortly after liftoff, the crew experienced unusual sounds and vibration from the Boeing 767, said Hawaiian spokesman Keoni Wagner. The flight turned around less than an hour into the flight. Crews discovered a panel on one of the wings, not part of the main wing structure, had come loose, Wagner said. A new plane was sent to Seattle and the flight departed at 12:20 a.m. yesterday, carrying 245 passengers. Wagner said the airline provided passengers with hotel accommodation and food. Thousands of Visitor Industry Charity walkers passed through a checkpoint station yesterday. The annual Visitor Industry Charity Walk raised more than $1 million for local charities, the Hawaii Hotel and Lodging Association reported. More than 8,600 people on Oahu, Maui, Kauai and the Big Island -- most of whom work in the tourist industry -- participated yesterday morning. This is the 30th anniversary of what organizers call the largest single-day fundraiser in the state. 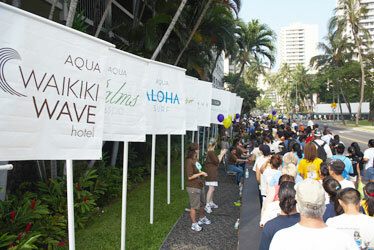 In Waikiki, participants enjoyed food and entertainment at 16 checkpoint stations along the route. A bipartisan group formed to educate voters on the 2008 constitutional convention ballot proposal plans to hold public forums on Maui and the Big Island next month. The Citizens' Committee on ConCon also is seeking public participation in its online forum at hawaiiconcon.org. Voters will decide whether to convene a constitutional convention at the polls in November. "We want to help educate the public so they can make an informed decision," said Rep. Della Au Belatti, one of the committee's co-founders. "We are a neutral organization. We want e-democracy to take over." Other organizers include former U.S. Rep. Ed Case and local technology entrepreneurs Burt Lum, Ryan Ozawa, Peter Kay and Jay Fidell. Members of the online forum group include Sens. Les Ihara and Sam Slom, former state representative and 1978 ConCon delegate Jim Shon and Hawaii Venture Capital Association Chairman Bill Spencer. A 23-year-old homeless man stabbed two people during a fight Friday night in Hanalei, Kauai county officials said in a news release. The incident occurred in the courtyard of Ching Young Village at 8:57 p.m. The victims, a 32-year-old man and a 24-year-old woman, both of Hanalei, were taken to Wilcox Memorial Hospital in serious condition, the release said. The suspect was arrested on suspicion of second-degree attempted murder and second-degree assault. Police said they arrested a 38-year-old homeless man for allegedly threatening a younger man with a knife. About 2:30 Friday afternoon, the suspect approached a 20-year-old man who was sitting in a parked vehicle at the intersection of Pauahi and River streets. Police said the suspect allegedly began yelling at the man while holding a knife behind his back. A patrol officer saw the incident and confronted the suspect, who then threw the knife on the ground. The suspect was arrested on suspicion of first-degree terroristic threatening, two counts of drug paraphernalia possession and two counts of promoting dangerous drugs.